On Thursday, December 12 Specialized Bicycles Founder Mike Sinyard traveled to Cafe Roubaix Bicycles to delivery a personal apology and retraction of legal threats against the retailer. Read the complete story here. Bicycle mega-brand Specialized created controversy today when news of legal threats against a small, Canadian veteran-owned bicycle retailer surfaced in the Calgary Herald newspaper. 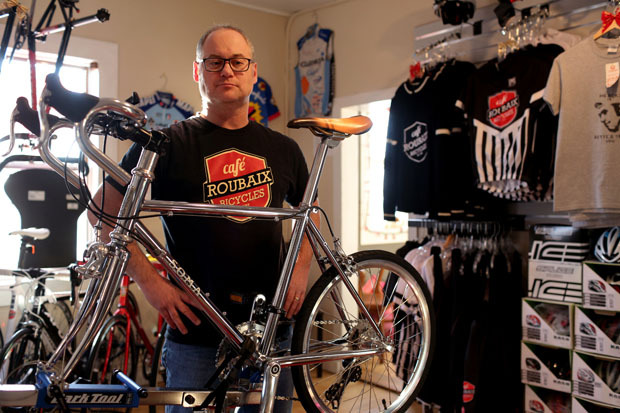 The story reports that Specialized Bicycles has threatened legal action against Dan Richter, owner of Cafe Roubaix Bicycle Studio, for using the word “Roubaix” in the name of his business. 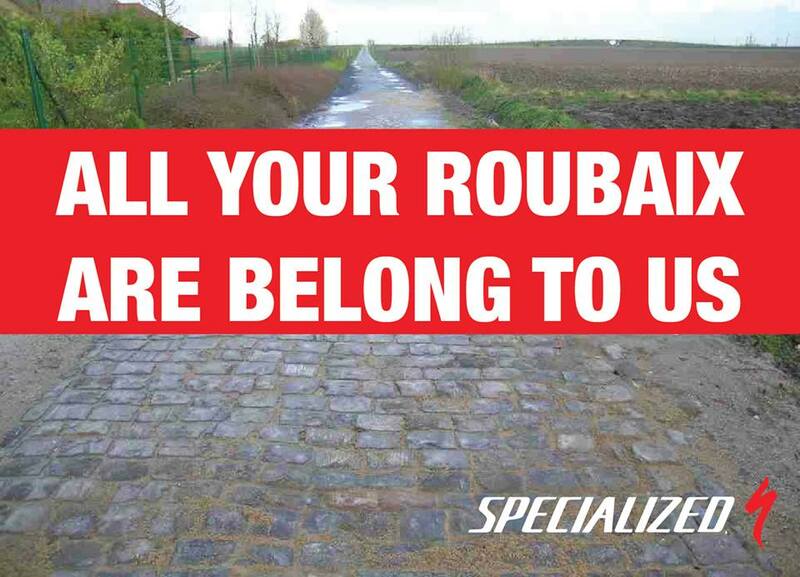 “Roubaix” is a widely recognized word in cycling usage from the famous spring classic bicycle race, Paris-Roubaix. Specialized Bicycles also has a series of bicycles named Roubaix for which they own some naming rights. The story has gained inertia on social media sites Facebook and Twitter, with thousands of views and an expanding number of “shares” and “retweets”. Comments on social media paint the picture of a bully corporation wielding legal might against a largely defenseless small retailer. Social media users have created images critical of Specialized Bicycles’ threat of litigation against small retailer Dan Richter. Public relations problems are common among large brands. Every major brand including Coca-Cola, Exxon, Wal-Mart, General Motors, Firestone Tire, Apple and others have had them. What determines the level of change in consumer perception following the initial incident is how the company responds to the situation. 1. Specialized needs a 24/7 disaster response team. Social media is a 24-hour job. Someone always has to be on duty, standing the walls of media outlets and conducting surveillance of media for early warning of impending disasters. This is especially important on weekends and at night in relevant time zones when social media is moving quickly. The Specialized Bicycles story achieved a transmission velocity across social media of hundreds of shares per hour when it began. 2. Specialized needs to own it. Specialized Bicycles is a truly great brand with a history of supporting dealers. What happened in Calgary could be termed an “accident”. Specialized needs to take full and unqualified responsibility. They need to use words like “mistake” and “error” in their press releases. There should be no qualifiers, no adjectives, no “reducing language”. The public needs to see them fall heavily and completely on their sword. Corporate apologies need to be succinct and clear: “We apologize for our error and for the damage we inflicted upon Cafe’ Roubaix Bicycle Studio and for the difficulties we caused for their owner, Mr. Dan Richter.” Again, no qualifiers, no backpedaling. They need to offer a clear and unqualified, one sentence apology. 4. Specialized needs to show tangible reparations for the mistake. The check book needs to come out. Specialized needs to re-win the hearts and minds of the cycling public with genuine (read: monetary) actions to “right the wrong”. This includes to the dealer affected and to the local cycling community. Given how quickly this story spread a few free bikes to the local junior cycling team, some cash to local event promoters and a very large “care package” of Specialized Bicycles and accessories to Dan Ricther and Cafe’ Roubaix Bicycle Studio is the start. 5. Specialized needs to work back channels and mainstream media to leverage the story of their damage control and ownership of the problem. This is when Specialized needs to call in media favors from all the publications and editors they have supported by issuing timely (under 24 hours) press releases to media about how they owned and fixed the problem. This needs to include the original “victim”, Dan Richter and Specialized. A photo of Richter and Specialized CEO Mike Sinyard or a top brass Specialized Sales Manager shaking hands in front of a row of free Specialized Roubaix’s going to the local cycling club needs to hit social media hard and fast before people forget. 6. Specialized needs to follow up. This is an opportunity for Specialized to leverage their loyalty to dealers. When they step up and do the right thing the example can be used as branding and sales capital for all their dealers to increase floor space and market share. Sales reps can point to Specialized’s prompt and complete response, reminding their dealers that, “No other bike company acts as quickly or in more complete support of their dealers.” If Specialized manages this incident proactively and wisely it can be converted from a marketing problem to a marketing opportunity. Is Specialized Bicycles a bully? “The public needs to see them fall heavily and completely on their sword.” I have worked with Sinyard personally a couple of times. This will NEVER happen. That guy has a HUGE ego. In 2006 Specialized sued Mountain Cycles over its use of the model name “Stumptown” (nickname for Portland), alledging it resembled the Specialized model name Stumpjumper. In 2011 Portland wheel builder Epic Wheel Works was forced to change its name due to potential trademark conflict with Specialized. In 2012 the company sued two former employees after they started the bicycle brand Volagi. Specialized lost on all accounts except one and was awarded one dollar in damages after spending 2.5 million dollars on the lawsuit. Mostly I think Specialized needs to stop being greedy and lame. They have, in recent years, strong armed dealers to stop selling other big box brands and enforced many other some-what oppressive requirements to being a dealer. Specialized make an un-godly amount of money, they should spend more time worrying about the betterment of the sport and less about the extra few $$ gained by being a heartless and soul-less corporate demon. Whats more is that many cycling affiliated brands and products carried the “Roubaix” moniker long before S. Fuji has done a Roubaix model longer that Specialized, and “Roubaix” Fleece is a well known and widely used textile in the cycling apparel industry. How can Specialized own the name if these companies used it fist?? Thank you for your note- appreciated. And, you are right. It didn’t occur to me until after I read your note. The thing is now the story is trending with thousands of views in the past 12 hours so I am a bit afraid to change anything. I do appreciate your insight though. My e-mail is tomdemerly@yahoo.com and I’m Tom Demerly on Facebook. All the best and happy holidays to you. Actually it’s the ability to resist a change in energy. So an object in motion tends to stay in motion, or a story once bobbing along at 100 likes per hour and shows no sign of slowing has a large inertia. It’ll take a bulldozer to stop it, so the original analogy was, at least scientifically, correct. Could seize this moment and show support for this vet and his bike shop. And they should. Like Marshall Field, master retail leader, “Give the lady what she wants.” He knew then what every brand ought to really embrace now- social media, public opinion rules. specialized needs to make this right. Hire a PR firm or a great marketing firm. I would love to quantify the cash loss this will cost Specialized in the long run. The millennial generation, especially, is so anti this sort of corp behavior. C’mon Specialized, they are your huge new market (they and their like minded older market). It’s those people who are out in force in solidarity via social media. There’s something very interesting happening with this story: Specialized is acting like any old bullying corporation (Monsanto suing farmers for using ‘free’ seeds comes to mind), with the major difference that unlike Monsanto Specialized operates on a market that is a/ very competitive (how many other brands big and small make bikes that can be substituted for Spec’s? many!) and b/ driven by customers who are passionate about the products they buy: almost nobody buys a bicycle because they ‘need’ it, it’s more of a life-defining, feel-good purchase. The gap between what the disgruntled Spec customers thought their bike stood for (freedom, sense of effort, environmental friendliness…) and what the manufacturer seems to be standing for (corporate greed and arrogance) appears almost unbridgeable. Too late for damage control? Tom Demerly with advice for Specialized on managing the PR disaster that is Café Roubaix.